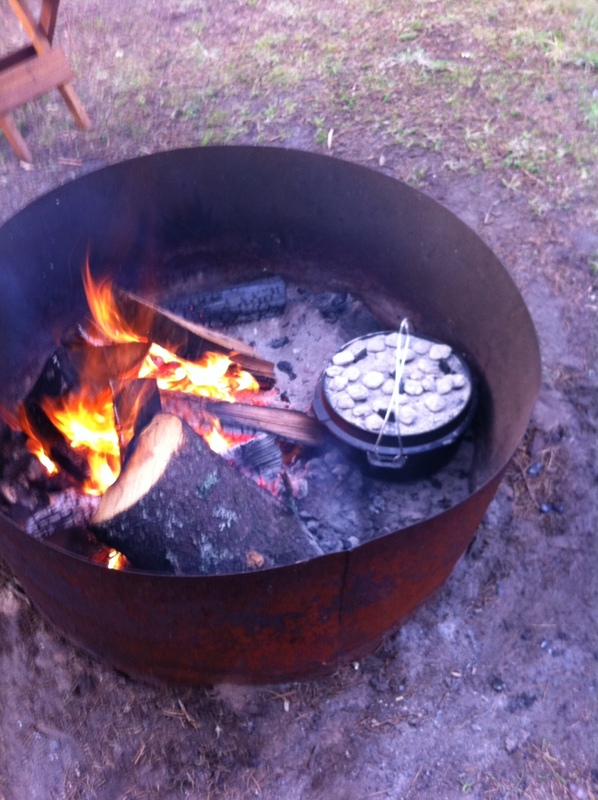 The Dutch Oven has been apart of our cooking history before the beginning of the United States.  It is cast iron and heavy and fairly simple to use. I think it is a great piece of equipment in the field while hunting or camping. On this trip, we joined our old great friends from Newberg to go clamming. 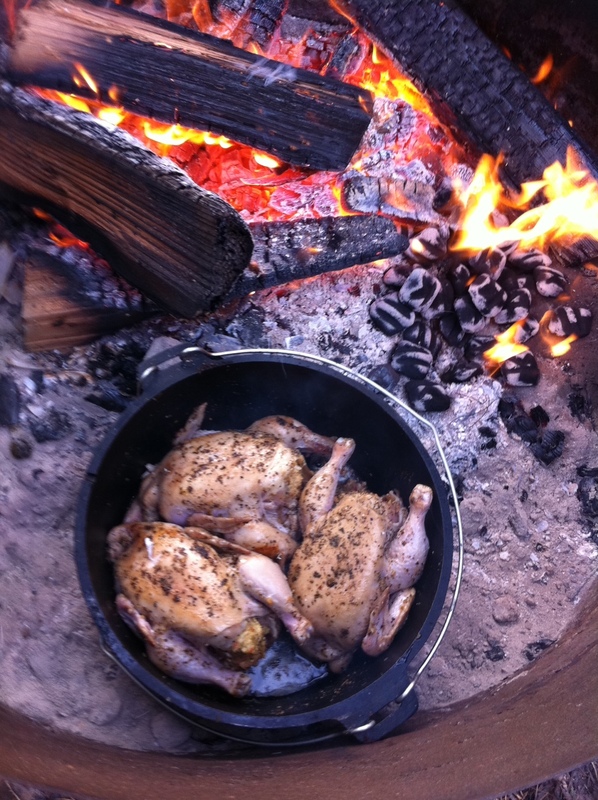 I recently bought a Dutch Oven recipe book that had a photo of Cornish game hens on the front of it. Well guess what folks? I read the cover from start to end and their was no recipe for the photo on the front. Who would do that? So I began my quest to perfect this dish while camping. 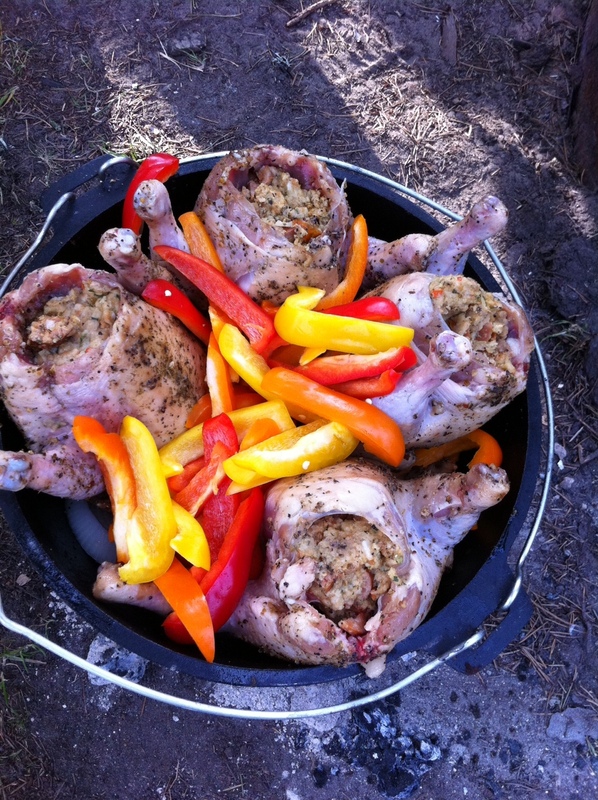 Dutch Ovens are fairly inexpensive, I think I paid 40.00 dollars for mine. You just need to keep it oiled and cleaned and they are not difficult to clean. 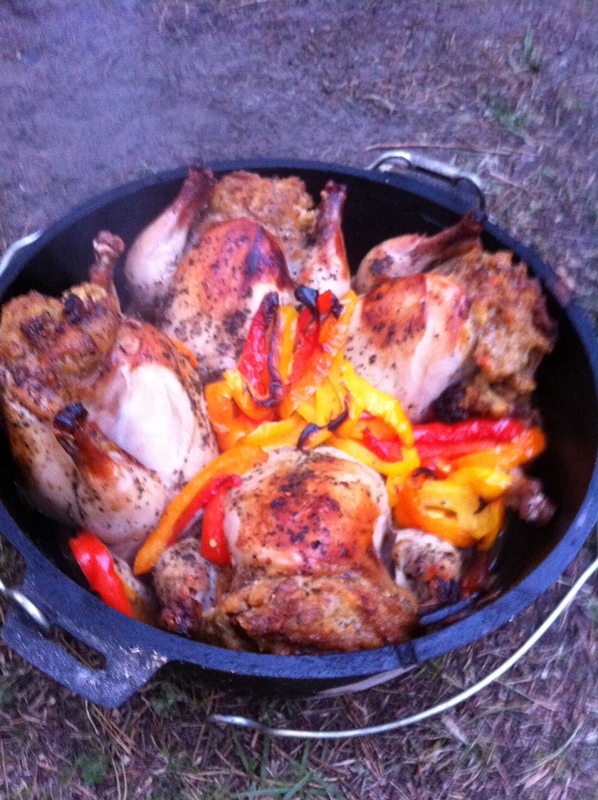 Here is my Dutch Oven story. The first thing you always do when cooking any type of bird is BRINE! I cannot say this enough, on how important it is. If it is a bird and with meat on the bones I brine everything. You will be amazed in the difference it makes with Thanksgiving to fried chicken. It makes the biggest difference in keeping the meat moist. It’s fairly simple to do. Gallon water, 1 cup of sugar, 1 cup of salt, 1 cup of soy sauce, and seasoning as you like (not necessary) I usually put in a 1/4 cup of Montreal seasoning. Boil, add ingredients, cook until it melts. I usually do all of this in four cups of water just to speed the process up then add more cool water. Add your meat and let sit over night in a cold place. For this recipe I only brine the Cornish game hens for 5-6 hours. Wash off brine, and dry. The stuffing I do not make myself, I uses stove top corn bread style, then I chopped up fresh onions and andouille sausage for a little kick and stuffed the birds. The andouille sausage will give it a little kick, and the dish will transition from sweet to hot flavors in your mouth. It’s not to hot, just a hint of spicy. Then I salt and pepper the birds rubbing them down with olive oil. 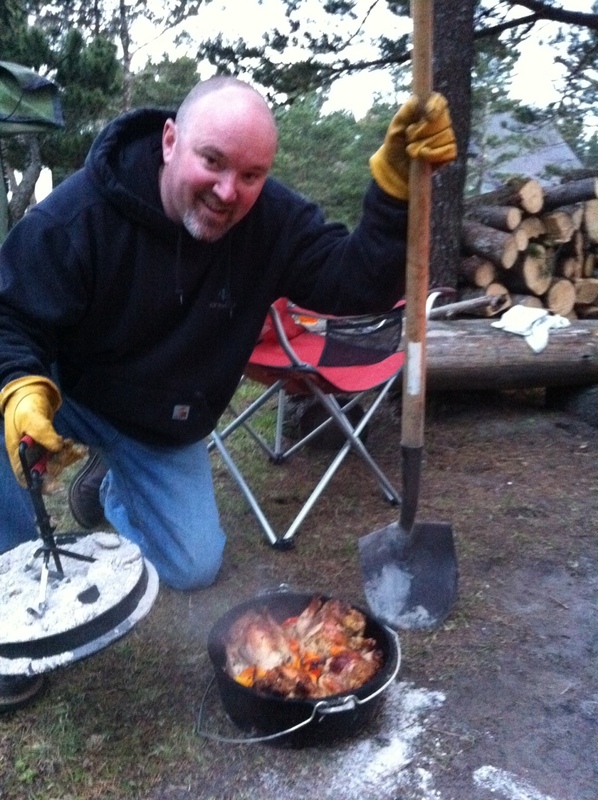 If you are going to use a Dutch oven you are going to need a shovel and gloves to handle the oven and the coals. 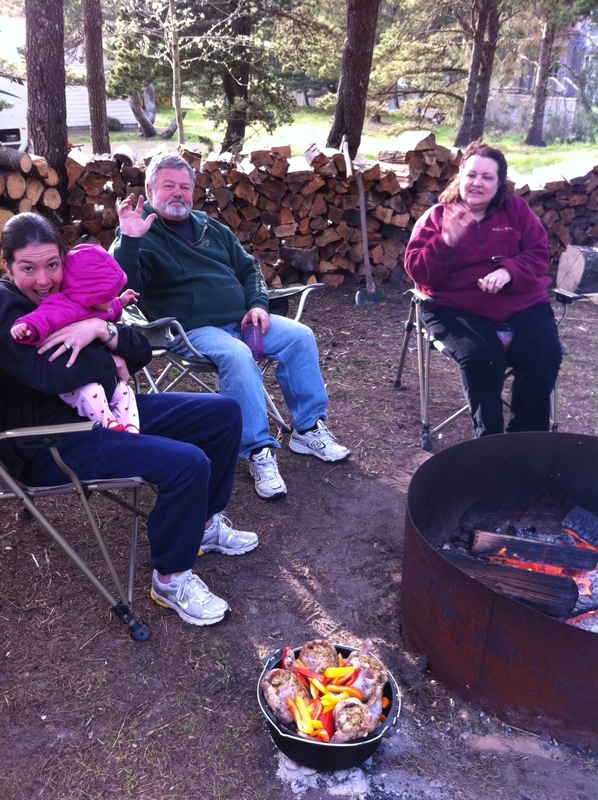 I laid down about 6-8 hot coals in the bed of the fire and put the oven on top. I added a little olive oil and butter and browned my birds. Once they have good color to them, I take them out and add one onion sliced at the bottom of the oven to keep the meat from burning on the bottom. I then add one can of chicken stock, one cup of white wine (don’t use the cheap stuff folks, get a good bottle that you would drink and pour a glass for yourself and your spouse). Add1 1/4 cup of sherry. I cut three sweet peppers length wise and toss them in. One red, yellow and an orange! Okay, now you have everything ready to go, set the dutch oven on top of the coals, put the lid on and add some coals to the top. Look at your watch and note the time. This is what it should look like cooking. Dont get it to close to the fire, you want to depend on the heat of the coals. Now after about an hour of cooking, its okay to take a peak at it to make sure it’s coming along. However, do not peak to often and do not let your friends open the oven either, because they will every five minutes and this will take away all your heat and pro long the time needed to cook. Here is what it looks like when you check. Please notice the shovel to use to put more coals on as needed, the lifting apparatus I purchased and MY GLOVES!! Okay now at this point it would be very beneficial to have a temperature gauge. However, I am camping, so I am old school y’all. If you can pull a leg easily away from the body, like its beginning to tear (don’t rip the leg off, actually I do then I eat my buddies leg then say “Yep its done”) then its done. Take off the heat source let cool for a five minutes then plate them by using tongs and a fork so they do not fall apart. Throw some of the peppers and onions on top. Your gonna have a sweet taste along finished with a smooth soft spicy finish and the hens will be moist to boot. That is how it is done son, I hope you try it.